Designed specifically for the new Gamo springer and Gamo gas ram airguns guns using the new plastic trigger module below. 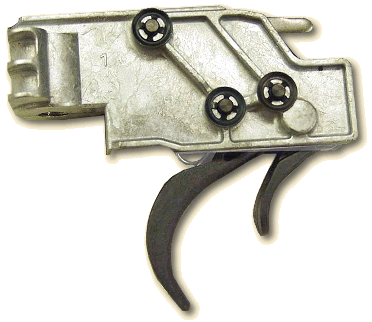 The picture above is of the late model Gamo plastic trigger module. The GRT-4G trigger applies to all late model Gamo rifles using the late modular as well as the SAT triggers. If your trigger block looks like the one in the pics below, the GRT-4G is the trigger for you. The GRT stands for (Gamo Replacement Trigger blade). The 4 stands for (For) and the final G stands for (Gamo) Therefore'. GRT-4G. The GRT-4G trigger blade is designed strictly around the new later model Gamo air rifles that now use the plastic trigger module. THAT INCLUDES THE NEW SAT TRIGGER. If it has the plastic trigger, it would use the GRT-4G trigger blade. The geometry and design does not lend itself to any other application and cannot be used in any other guns at this time. It will work in any of the Gamo spring powered rifles or gas ram rifles including future modifications to gas ram. With the earlier model Gamo air rifles (and also all of the Gamo airgun clones), one of the big issues was the terrible trigger. It had a very hard long pull and you never knew when it was going to let off. 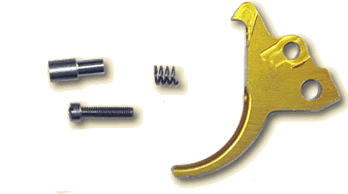 It utilized the Theoben/Gamo trigger design and it was one of the biggest drawbacks to the shooters accuracy. The shooter is always concentrating on the trigger and not the target and it is almost impossible to keep from pulling the gun off target when shooting the gun. The new Gamo factory trigger design has all of the same issues that the earlier Gamo model guns had and many say that it's even worse. This new factory trigger change is in all of the newer model Gamo air rifles and we don't expect any changes in the near future. So. you don't need to contact me to ask if the GRT-4G fits in a particular late mode Gamo. It fits all of the late model Gamos with the plastic trigger. The GRT-III trigger was designed to resolve the early model Gamo trigger issues and the GRT-4G is now the solution for the late model Gamos. As with the GRT-III, the GRT-4G trigger blade will help to greatly improve your accuracy in your late model Gamo. The GRT-4G trigger blade changes the internal geometry as well as the ergonomics of the new Gamo trigger module using the plastic trigger and converts it from an allegedly 2-stage trigger to a true 2-stage trigger geometry while at the same time dramatically reducing the pull weight and still not compromise their new three point safety trigger. NOTE: The latest production of the GRT-4G trigger blade no longer has a 1st stage adjustment screw. There are two reasons for this. One is that the optimum 1st stage adjustment has now been machined and built into the trigger blade and two; it prevents accidentally compromising the safety. But it's not just the improved trigger pull that makes the GRT-4G trigger so great. Just as important and maybe even more so, are ergonomics of the trigger. The ergonomic design change greatly enhances the trigger with a far more controlled trigger pull. It's what assists in making the big difference in the improvement of both accuracy and consistency. There are a few out there that say that ergonomics doesn't matter.... but......, those that have experience with both the OEM trigger and the GRT-4G trigger blade know the difference and given the choice, will choose the GRT-4G trigger every time. It's a matter of what you expect for your money and with the GRT-4G trigger blade you get it all. We have sold a great many GRT-III trigger blades to satisfied customers over the years all over the world. And why did they buy' Because they were solving the problem with an inexpensive genuine fix, the complete trigger blade itself. They did this rather than attempting some less efficient work around to a true existing problem with mediocre or second rate repair that just won't work. The GRT-III trigger blade resolved all of the trigger problems and not just reducing trigger pull. That and the superior beauty, quality, and craftsmanship! The fact that it works and it's safe and that it has a long history with a long proven track record the world over speaks for itself. You can expect nothing less from the GRT-4G trigger blade. It will work in all of the late model Gamo spring powered rifles or gas ram rifles including future modifications to gas ram that employs the plastic trigger blade module. IT WILL NOT WORK IN ANYTHING BUT THE LATE MODEL GAMO GUNS WITH THE PLASTIC TRIGGER MODULE. NOTE: There are a couple of ways to determine if yours is a late model trigger. Check the trigger blade with a magnet. If it is steel and not plastic, then go here to check out the GRT-III trigger page. You can also remove the stock and see if the trigger assembly looks like these pictures. If it does, then it would require the GRT-4G trigger blade. Finally'a note of appreciation at this point! I know that everybody gives all the credit to CDT and it is appreciated. However, without my machinist, none of this would have been possible. There was a lot of trial and error, many many hours in the R&D, testing, retesting and ongoing modifications of the geometry in the designing and production of both the GRT-III and the GRT-4G until we got it right. These projects and the end results would not have been possible without him, working side by side with me together in a team effort. And we keep looking for way to improve our products. I would also like to give special thanks to Herb Williams who with his special Web Site building abilities and talents for helping me with the website and page constructions of the CDT website. I would also like to thank Gene Curtis and the GTA forum, the forum staff and the forum membership for their great support and encouragement for this endeavor. Again' it has been a team effort of all of the above to bring this to fruition. To see the complete installation video play list by Bert Wolf (Brutuz62) for the GRT-III and GRT-4G triggers, Click Here. Below are links to the installation guides (PDF and Word files) for the GRT-4G trigger for you to review prior to purchase. I suggest that you review them prior to ordering. Also, when you purchase the GRT-4G trigger, as a bonus, you will be receive a basic tune guide as part of the purchase at no additional cost along with your confirmation and installation instructions.